The Spanish equestrian federation have announced the team that will represent Spain in The World Equestrian Games to be held in Normandy, France, from the 23rd August to 7th September. The team at BHM is excited to see a number of purebred PRE horses on the team in both dressage and driving. We will be keeping you up-to-date on the scorings and direct you to the best live streaming. Norte Lovera, from Yeguada Lovera, will be ridden by José Antonio García Mena. Norte is an exceptional stallion, proven as a morphology competition horse and dressage champion . José Daniel Martín Dockx will ride Grandioso, owned by Hampton Green Farm and bred by Yeguada Marín García. 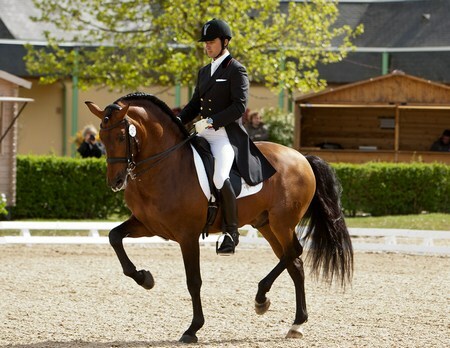 Grandioso competed at the 2012 London Olympics, and is the 2014 Champion of Spain for Dressage. He is the highest scoring PRE in Aachen History. José Barranco driving his lovely team of greys – Altanero JEM, Furtivo XLI, Almonte, Distraído and Pudiente. Juan Robles will drive the Military Stud Farm’s team – Benavente I, Cepellón, Fermentado, Fresado, Recluta V, Tensor and Velero XI.